I purchased this set for my teenage granddaughter.....what a hit! She just loves it. The colors and pattern inspired her to paint and redecorate her whole bedroom. I would recommend it to every girl looking to add style, color and cheer to a bedroom. It is also warm and the the pillows add a nice touch. Make a statement with the Intelligent Design Odette Boho Coverlet Set. 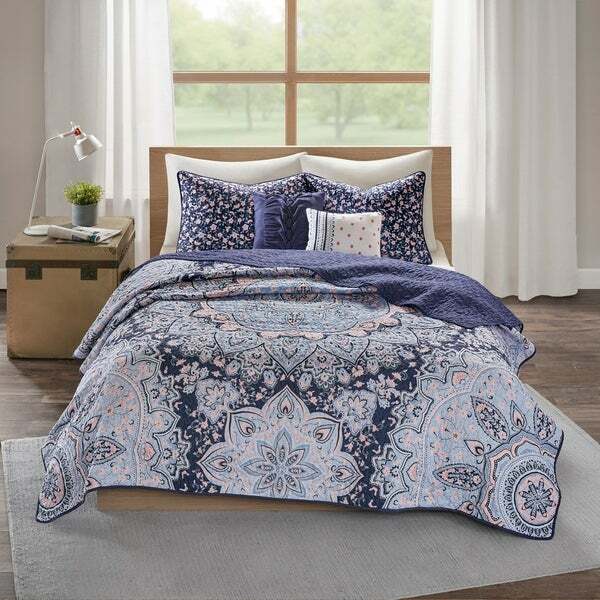 A gorgeous over-scaled medallion, complemented with floral accents, is printed on the face of the coverlet in bold navy hues. A solid navy reverse adds a rich touch of color to coordinate with the top of the bed, while the cotton rich filling provides exceptional warmth and comfort. Coordinating sham(s) feature a floral print to provide a charming accent. Two decorative pillows, one with fabric manipulation and another with multi-colored embroidery, offers the perfect finishing touches to the set. Prewashed for a soft hand feel, this boho coverlet set will set the perfect ambiance in your bedroom. The old bedspread was a dark blue and made my bedroom look dark. The Skye Blue Boho 5-piece Coverlet Set was a welcome change. It brightened my bedroom considerably, and made the room appear larger. The bedspread was light weight, thereby making the bed a breeze. My cat, Little Lulu likes the Coverlet spread as well, and the material resists her claw-work nicely. The design on the pillows really compliment the Coverlet without overpowering it. All-in-all I was very happy with my Skye Blue Boho 5-piece Coverlet Set! Very pleased with these comforters. I ordered two. We are moving to a new house and these will be perfect on the twin beds I have in a spare bedroom. I love the accent pillows and sham that came with the comforter. They compliment. It very well. More pink than picture. Still very beautiful. Love the combo of colors. Looks more neutral in the pictures than what was shipped.